Rising concern over the increasing threat of nuclear war impelled the 2017 United Nations (UN) negotiations and adoption by 122 UN member states of a Treaty on the Prohibition of Nuclear Weapons. The Treaty seeks to ban nuclear weapons globally in the same way chemical and biological weapons have already been prohibited. 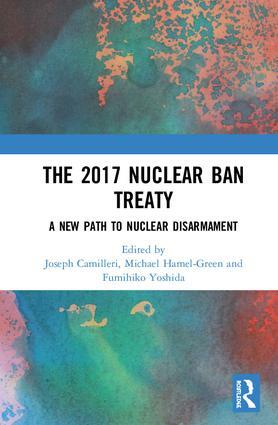 This book provides the first in-depth comprehensive analysis of the implications and possibilities of the new treaty, drawing on the insights of international relations, international laws, and disarmament experts and specialists from Europe, America, the Asia-Pacific, and the UN. In a context where existing nuclear weapon states have so far declined to be party to the new treaty, the book examines not only its emergence and significance but also the prospects and possibilities for its implementation, the challenges associated with verifying the new agreement, the role of both civil society and governments, and the treaty’s wider implications in addressing regional and global nuclear threats. This book was originally published as a special issue of Global Change, Peace & Security but additionally includes the special section articles on the treaty in the Journal for Peace and Nuclear Disarmament. Joseph A. Camilleri Order of Australia Medal (OAM) is Emeritus Professor at La Trobe University, Melbourne, Australia and a Fellow of the Academy of Social Sciences in Australia, Canberra. He was the Founding Director of the Centre for Dialogue at La Trobe University, Melbourne, Australia (2006-2012). He has authored some 20 books and over 100 book chapters and journal articles. His research has centred on security and peace studies, governance, international political economy, religion and culture, and the Asia-Pacific region. He is the Founder and Executive Director of Alexandria Agenda, Melbourne, Australia - a new venture in ethical consulting specialising in governance, diversity, and education. Michael Hamel-Green is an Emeritus Professor and former Dean in the College of Arts and Education at Victoria University, Melbourne, Australia. His research has focused on regional nuclear-weapon-free-zones, nuclear non-proliferation, and multilateral negotiations. He is a Co-Chair of the Panel on Peace and Security in Northeast Asia at Nagasaki University’s Research Center for Nuclear Weapons Abolition (RECNA), Japan; Chairperson of the Editorial Board of Global Change, Peace & Security;and Board Chairperson of the Australian Living Peace Museum, Australia. Fumihiko Yoshida is a Professor and Vice Director of the RECNA at Nagasaki University, Japan. He is the Editor-in-Chief of the Journal for Peace and Nuclear Disarmament. He was Deputy Director of the Editorial Board of the Asahi Shimbun, Tokyo, Japan. He served as a member of the Advisory Panel of Experts on Nuclear Disarmament and Non-Proliferation for Japan's Minister of Foreign Affairs, Tokyo, Japan. He has a PhD in International Public Policy from Osaka University, Japan (2007).